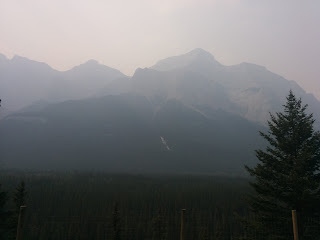 The rain in the night had cleared some of the smoke haze and the mountains were a lot clearer when we awoke. The oats were finished yesterday so the Weetabix count was reduced by 6. Unfortunately the holiday had to finish before the box was empty. We packed and were grateful for our additional checked bags for the return journey and 2 carry on bags each were allowed. The glass and pottery items and holiday souvenirs were safely packed in our carry on bags. The keys were put back in the lock box and we shut the door of the apartment by 10:00 am . We drove to the town centre and had a quick look in the museum. A burst pipe had flooded the ground floor last year so they had a temporary exhibition about the Canmore floods whilst they restored the displays. The small shop had the best value postcards in Canada.This was true until Louise discovered later in the day that the post office in Banff sold ready to mail postcards for the same price of a stamp! 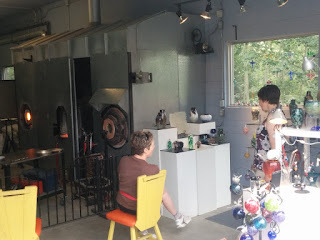 We then drove back to the Fireweed glass studio so I could purchase another piece of glass. It was a different artist in the studio today. The magic card worked again and I left with a well wrapped souvenir. 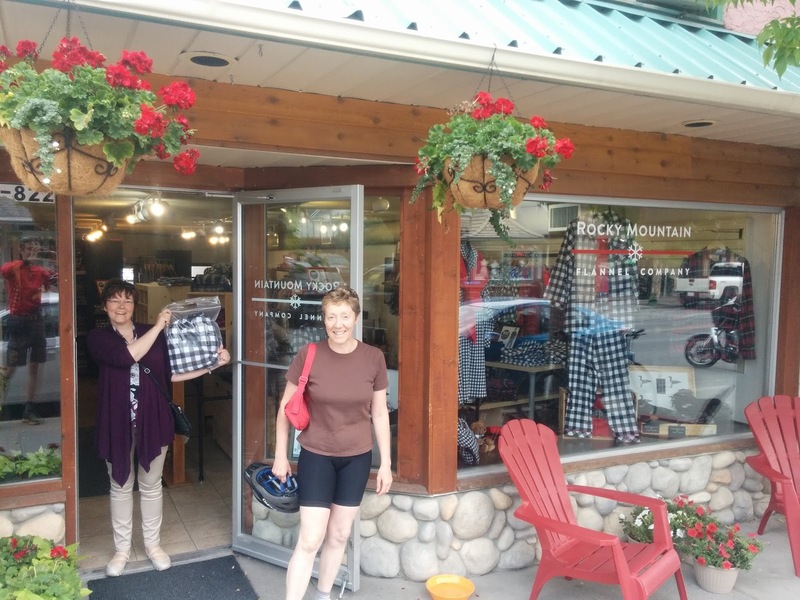 Next stop was the Hudson Bay Trading Company department store in Banff. We called in on our bike ride the other day to discover that Canadian Levi's are over half the price they are in the UK. I purchased 3 pairs. The assistant recommended the Bear Street Tavern for lunch so that was our next stop. A couple of starters and 3 pizzas later and we where ready for canoeing. 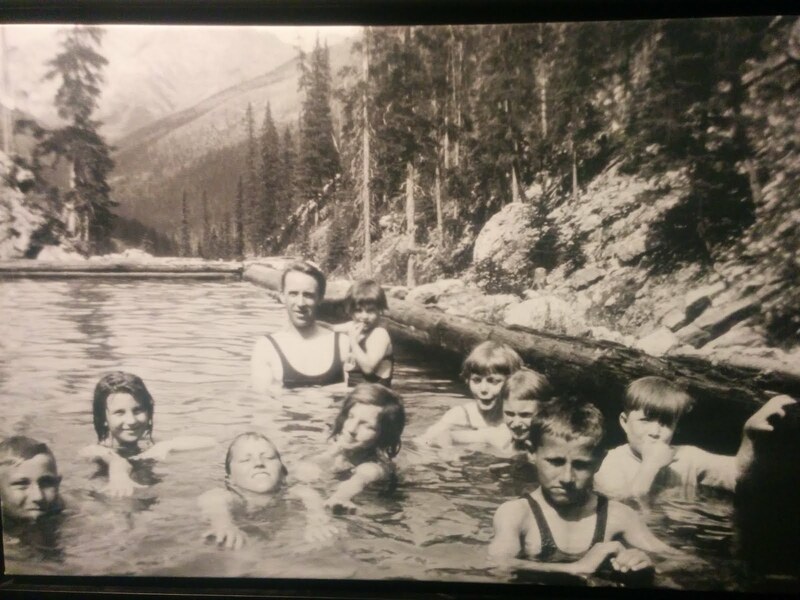 A 3 man Canadian canoe was hired from the Banff Canoe club. Good value at $55 for 2 hours. We set off upstream. The water was a fantastic shade of blue, the mountains had cleared and the paddle offered good views of surrounding countryside. 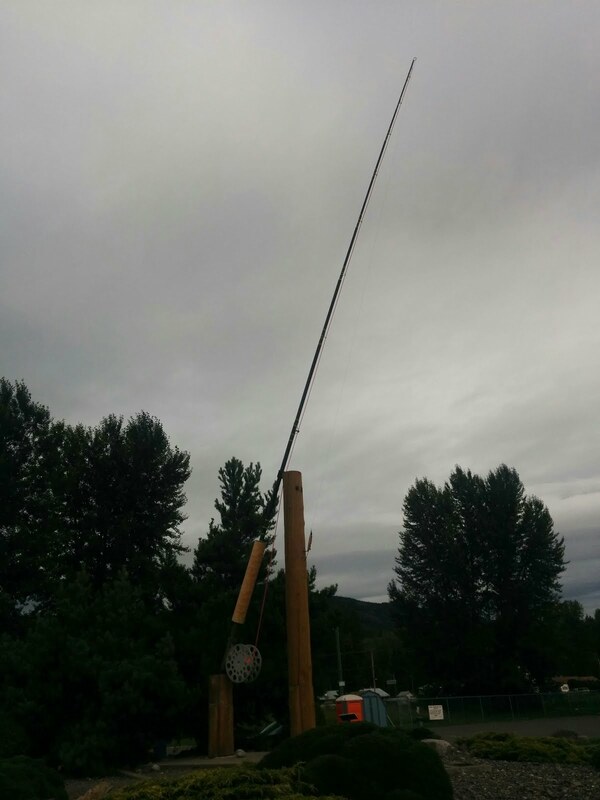 The bonus was when a passing canoe said they had seen an elk a couple of bends further on. This turned out to be a 10 to 15 minute paddle. 10 minutes after we were going to turn back we were rewarded with the sight of a massive male resplendent with a fine set of antler's. We stayed towards the far bank - are elk good swimmers? You are advised to keep 30 metres away from an Elk. A wonderful sight. We spent 1 hour 10 minutes paddling upstream and less than 50 minutes getting back. Just before we were back there were a few spots of rain. A wedding party were having photos taken on the jetty. We had the choice of waiting and getting wet or mooring and enhancing the photo. We opted for the latter. This was a good decision as the rain intensified once we were back on dry land. We sent Louise to get the car whilst Lyn and I waited in the dry. The 90 minute drive to Calgary was uneventful. The scenery changed dramatically from hills and trees to flat plains and grass as we got closer to the city. Kate located a petrol station near the airport and we took the opportunity to sort out the cases and final packing. We returned the car to Avis and made a final check that we had removed everything. The airport was quiet and after a short delay and lots of computer input from the check in staff we finally had our boarding passes. We sat down to eat the last of our food. I opened my money belt and realised I had left my iPod on the back shelf of the car when we repacked the cases. Avis were great. The car had already left the airport and been taken to the depot. A quick phone call and they had located my iPod and sent a driver off to bring it back. The flight to Heathrow was uneventful. The evening meal was good but breakfast snack was very disappointing. Nothing savoury. Louise took one look and went straight back to sleep. We had about an hour to get our connection to Manchester and bought some sandwiches to eat on the plane. When we waited in Manchester by the luggage carousel we expected our names to be called and the luggage to still be at Heathrow. The bags slowly appeared. The car was collected from the Meet and Greet and we arrived back home before 6:00pm. We checked the glass and pottery was still in tact and went to a local restaurant for tea. The finish of a fantastic 3 weeks. 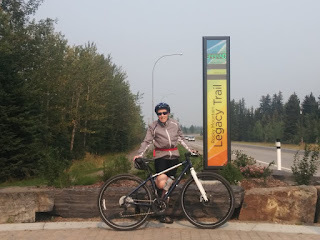 Last evening's plan looked good on paper, breakfast, book a brewery tour, visit glass studio, shops and lunch in Canmore, return bikes ,1 pm brewery tour then canoeing in Banff. We the first part worked(breakfast) however on getting to the brewery we found it did not open until 11.00am. The glass studio was a 10 minute bike ride , Louise followed in the car. However when we arrived we found the studio did not open until 11 either and it was only 10 :40. A visit and coffee at a nearby delicatessen solved the problem. Fireweed Glass Studio is run by 4 local artists. The work was excellent and we liked most of the items on display. 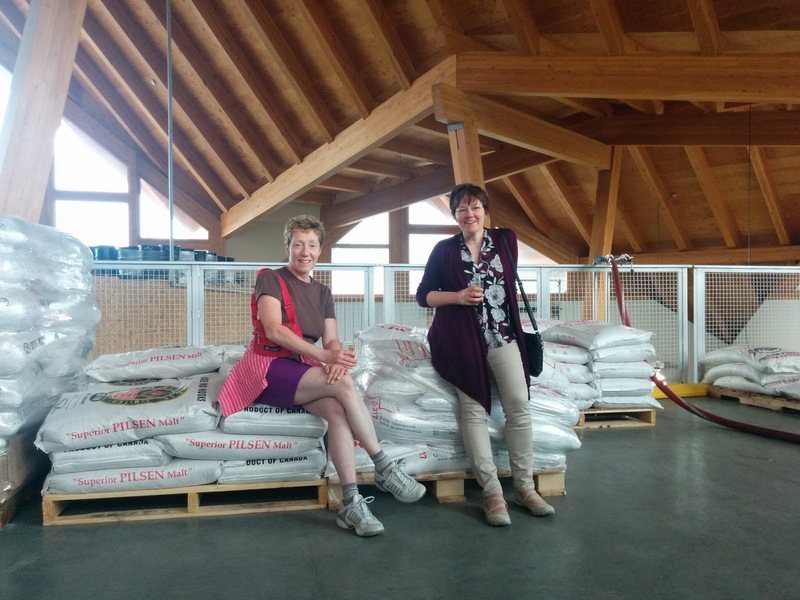 One of the owners Barbara Rumberger was in the studio. She was very friendly and gave a quick demonstration whilst we rearranged the display and selected some items to purchase. Lyn and I bought a couple of small pieces and even Louise joined in. By the time we left it was lunchtime. 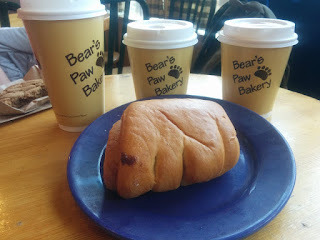 The Rockie Mountain Bagel Company provided some excellent sustenance. Eventually it could not be put off any longer and the ladies had to visit the shops. They were detained by a shop that sold flannel clothing and spent so long in there they needed an ice cream or in Louise's case a crepe to recover. The bikes were then returned and it was to the Bears Paw brewery for our 4:00 pm tour. Having read the extensive contract and signed the waiver the the two of us drinking beer were given the first of 4 small sample's. We then had a larger glass of the one we preferred to take in the tour. Louse had various flavour sodas to try but the choice was more limited. 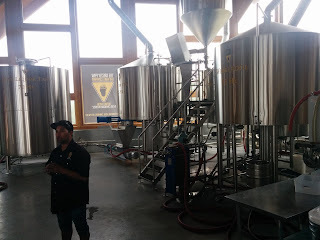 The tour was more sampling than information but as we were taken around the brewery the brewing and bottling process was explained along with some more samples to try. 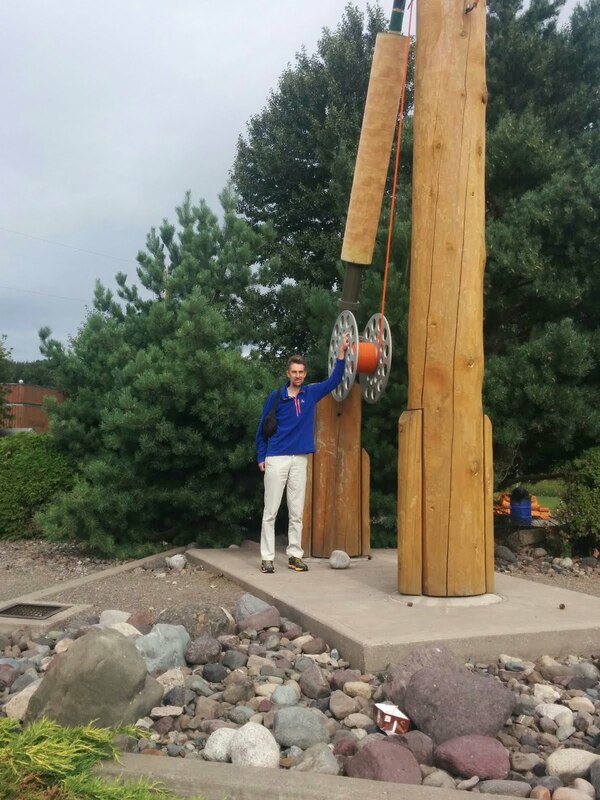 From a production engineering point of view the process looked a little disjointed and had plenty of opportunities for improvement. We left with our souvenir bottle opener and Louise did the driving. Back in the apartment we made the first attempts at packing and had time for a hot tub and swim before another excellent meal. Fresh sweetcorn followed by bacon wrapped pork tenderloin then fresh fruit and yogurt. We arrived yesterday evening just after 10pm. We passed the Krypton Factor test to gain access to the apartment. 5 digit pass code to open the access to the underground parking. 2 digit code to access the room lock box to get the key to the room and then we were in. The accommodation was recommended by a work colleague of Lyn's and is the best we have stayed in on this trip.. We have two very large bedrooms. Mine and Lyn's has a large shower, Jacuzzi bath and his and her sinks. Louise has to be content with 2 queen beds and separate bathroom with bath. We have a massive open plan living area with a kitchen and outside balcony. 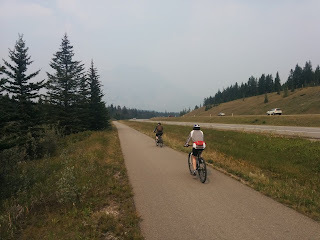 The day started cool but the forecast was for a dry day and an afternoon temperature of around 20 degrees so we decided to cycle the Rocky Mountain Trail also known as the Banff legacy trail from Canmore to Banff. We hired bikes from Gear Up. They had a bike that would fit me, were friendly, had better bikes than the shop in town we tried first and rejected because the frame was too small for me. They were also $15 cheaper. The day hire is $45 for a full 24 hours. "Bring it back around this time tomorrow ,we won't charge you if you are late". The Rocky Mountain Legacy trail was built to celebrate Parks Canada 125th anniversary. Its a 26 km trail that connects Canmore and Banff. The route runs parallel to the main highway and would have offered stunning views of the mountains if the smoke haze had not been present. The path is 3 metres wide and has a couple of small climbs with only one very short section you would describe as steep. It runs parallel to Highway 1 and the road noise was a little invasive at times. 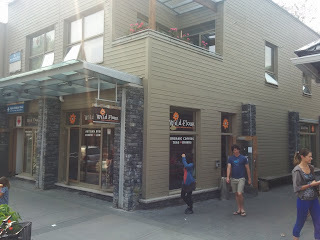 We arrived in Banff just before 2:00pm. Lyn rejected my first suggestion for lunch. 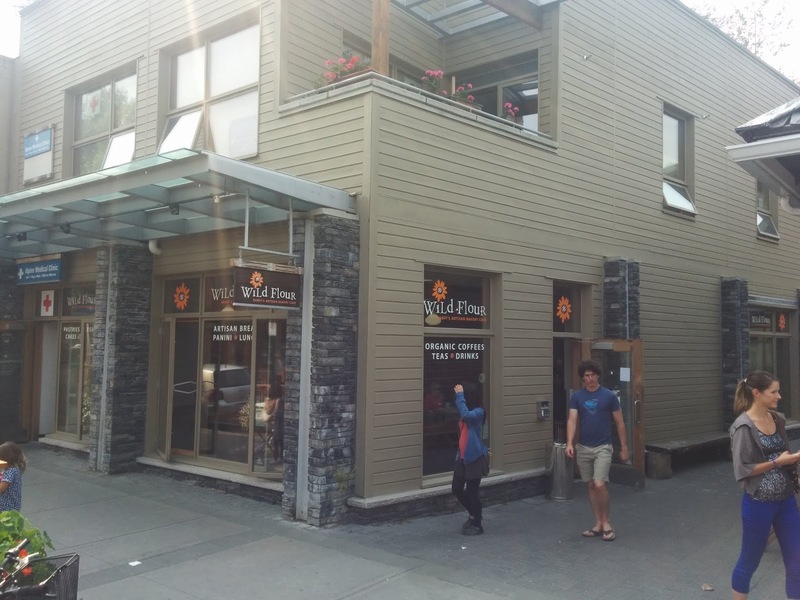 However the second offering Wild Flour artisan bakery cafe had her seal of approval The food was excellent and judging by the queue of customers we are not the only people to reach the same conclusion. After lunch Louise decided to do some more souvenir shopping and get the bus back whilst Lyn and I cycled backed. However when she left I realised I had not shared the magic code to get though the main door. Lyn and I then toured the high Street searching likely shops until at last she was spotted. The ride back had more down hill sections so was easier than the ride out. Louise returned her bike to the shop but Lyn and I cycled back to the apartment. We arrived back in time to enjoy a swim,sauna and hot tub. The ingredients for tea were purchased from Save On Foods and an excellent pasta meal then prepared in the apartment. We had breakfast in the room. There were no spoon's so the Weetabix count remained unchanged. After breakfast we took the lift to the ground floor and the Interpretive Centre. 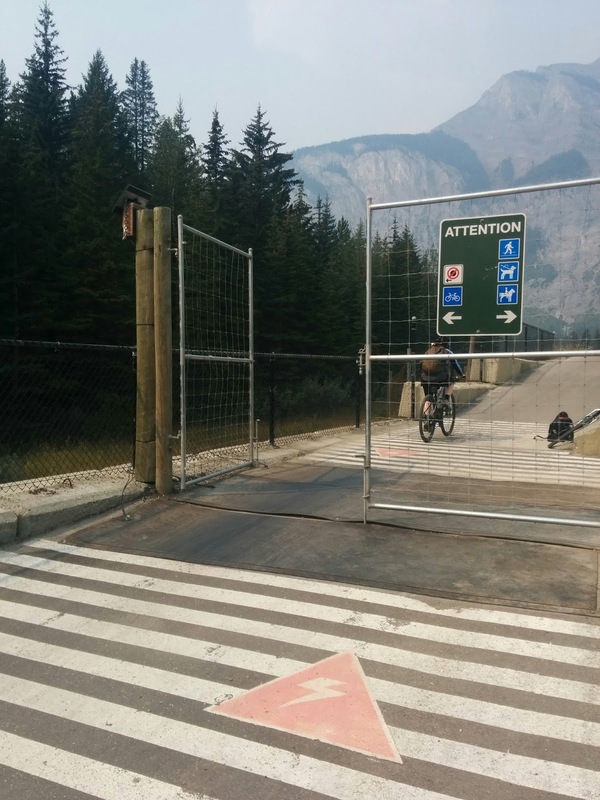 It is run by Parks Canada and the film had been running for over 10 minutes before they unlocked the doors. We watched the last 10 minutes of an arty film with lots of splendid shots of scenery but no factual information. A lost opportunity. 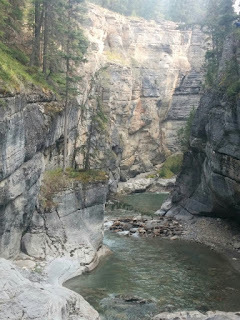 We checked out and continued along the Icefield Parkway stopping first at Saskatchewan River crossing. The gift and souvenir shop provided another shopping opportunity but we left without making a purchase. Unfortunately the mountain views were still obscured by the smoke haze. We talked to a group of cyclists who had abandoned their ride 4 days early because of problems with breathing caused by the smoke. They had cycled over 1800km on this trip and across Canada last year so their general finess was not why they stopped. 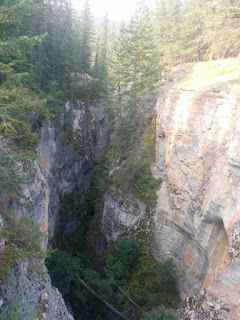 A short distance further on and 300 m from the road side parking was the short decent to Mistaya Canyon. More impressive views where the river had carved the Canyon though the layers of sedimentary rock. 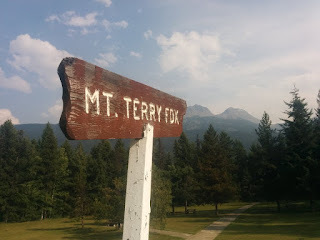 We then continued to Bow Summit, at 2135m the highest point along the Icefield Parkway. 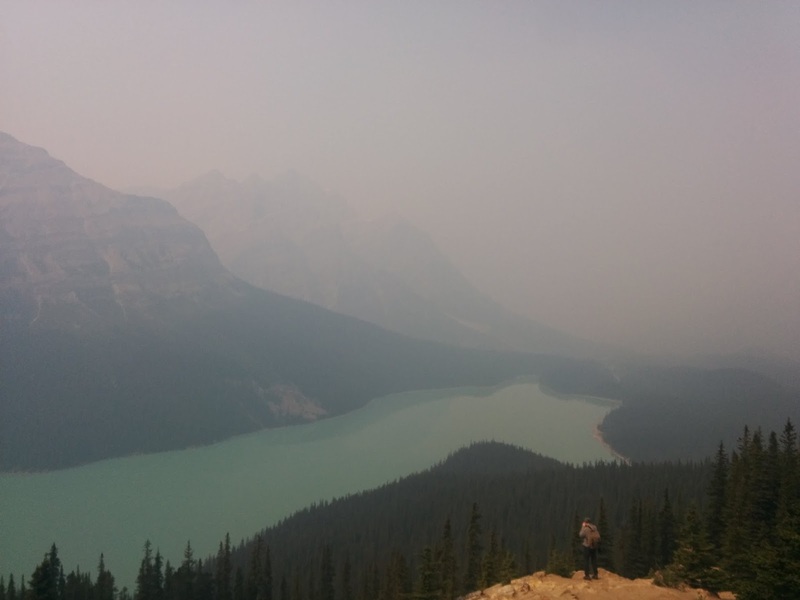 A short walk from the car park provided an excellent view over Peyto Lake. We sat at the view point and had an apple and virtual cheese sandwich for lunch. 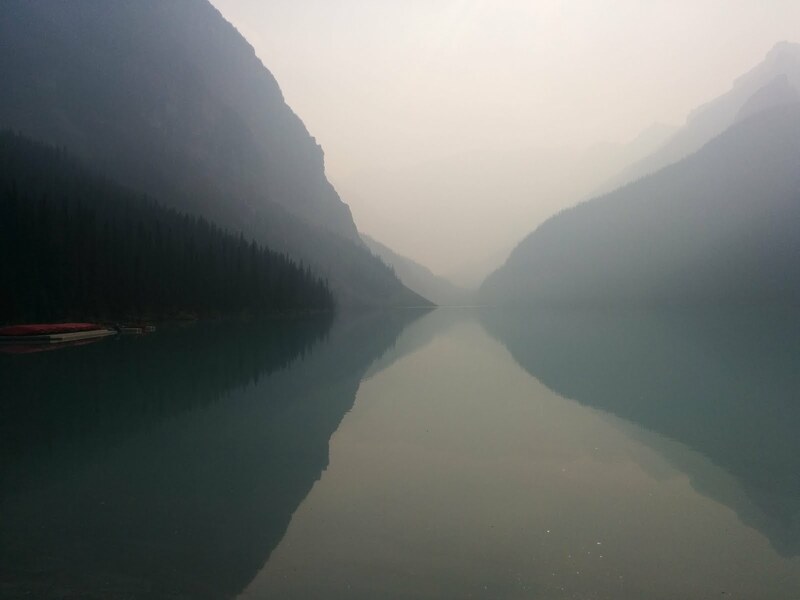 The faded blue of the lake tantalising us with what the view would be like on a clear day. A golden mantled ground squirrel ,obviously used to tourists, appeared as we were eating was fed nuts by a couple of children. Next stop was Bow Lake. A photo opportunity, gift shop and cup of tea. 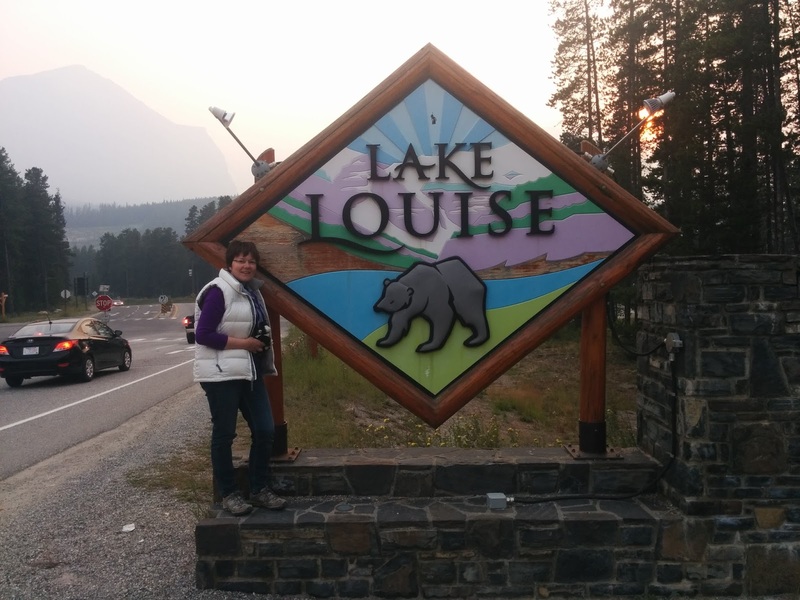 The first place of interest after the Icefield Parkway is Lake Louise. 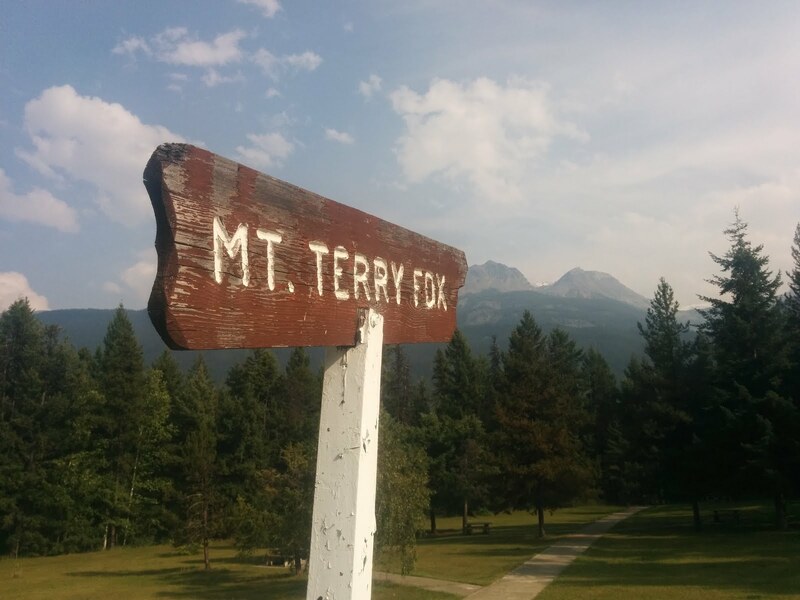 It's the name of both the village and lake. Naturally we had to stop and take photos. We arrived late in the afternoon as the number of tourists started to thin. The lake was pretty but it was a pity the smoke haze was obscuring the mountains. 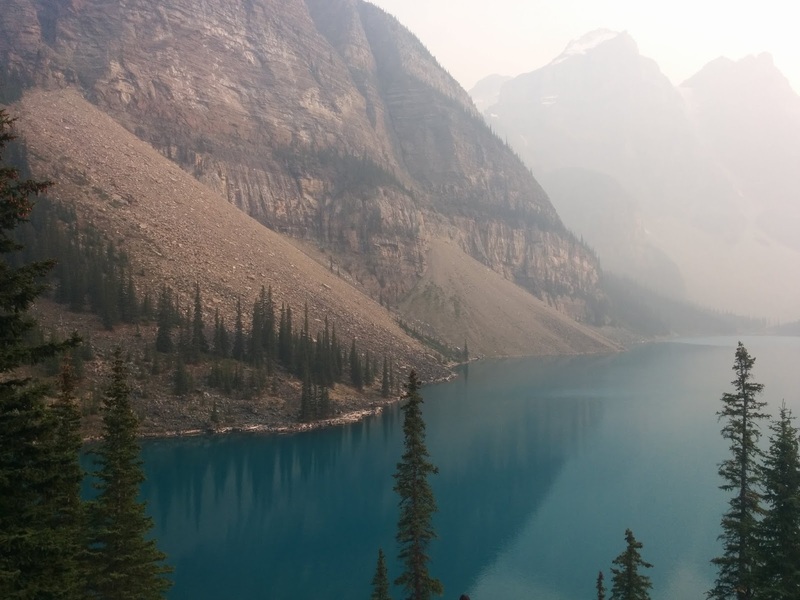 The other famous lake in the area is Lake Moraine and as the distance to the Lake was around 18km we decided to drive to it. The mouth of the lake provided some good photo opportunities but for the best view you need to take the short climb to the view point. This gave a splendid view of the lake with its various shades of blue. 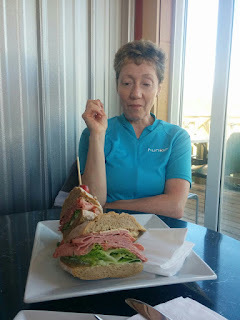 It was approaching 7:00pm by the time we were down from the view point so we tried to eat in the Moraine hotel restaurant. The food looked excellent but their next free table would have been an hours wait. We drove to Lake Louise instead and ate in the Mountain Restaurant. The meal did not live up to the splendid scenery we had seen during the day. The Weetabix count was reduced by 2 then it was off to the Maligne Canyon. It is crossed by 6 bridges and you can walk then entire route. 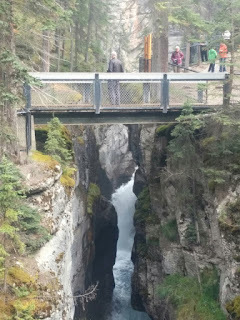 Its a 6.1 km hike from the sixth bridge but the most spectacular parts of the Canyon where it narrows are between bridges 1 and 4 and these can be reached by a short walk from the top car park which is what we did. 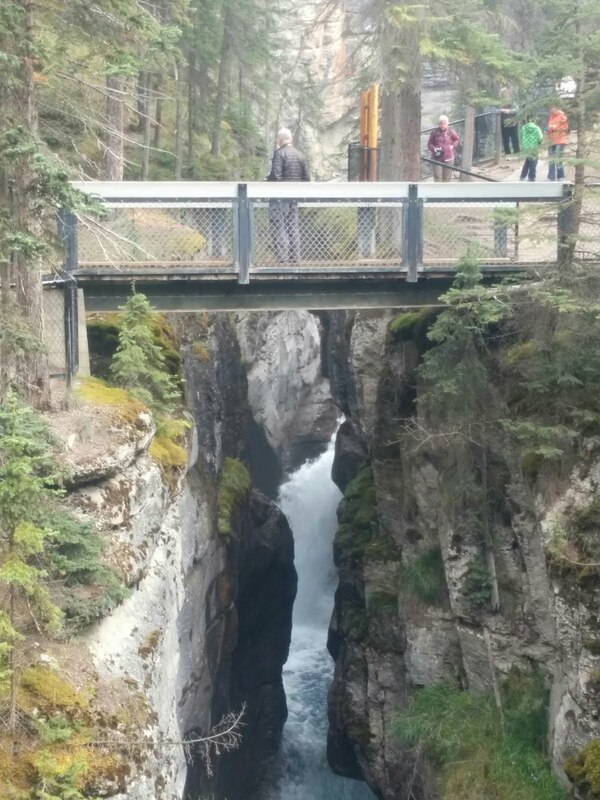 Its a very impressive deep gorge and well worth the visit. 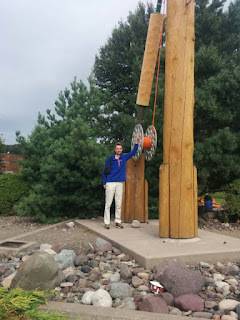 Photos and video were taken from various view points. An early lunch was had in the cafe near the car park but not before the souvenir shop was investiged. 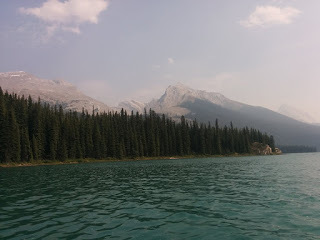 We then drove a .further 40 km up the valley to Maligne lake. The journey took around 40 minutes as speed was restrict to 70km/h for the majority of the route. Louise opted for a boat trip to Spirit Island. Its was made famous in an advert in the 70's for Kodak Colorama film and now one of the most famous and photographed views in the Canadian Rockies. Spirit Island turned out to be a peninsula and you could only walk on the dock and mainland and not the peninsula. The lake level rose earlier in the year and apparently it was an island for 4 days. The views were spoilt a little by the hazy sky. Whilst Louise was on her trip Lyn and I hired a canoe for a couple of hours. Having signed the disclaimer absolving the hire company of any responsibility we were given a quick safety briefing before we were out on the lake. The water temperature of the lake was 4 degrees and if you fell in you would suffer from hypothermia in 5-10 minutes. We paddled up the lake following the shoreline stopping occasionally to watch the birds on the shoreline and on the water. 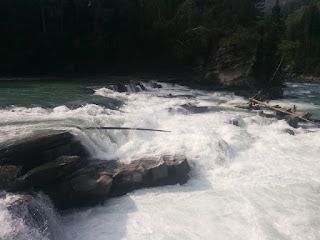 The bow of the canoe had to pointed into the wake of the tourist board as they passed. They slow down when they spot a canoe . Fortunately it was very stable and we returned to the boat house without any major incident. We had an early dinner in the Fiddle River restaurant in Jasper. 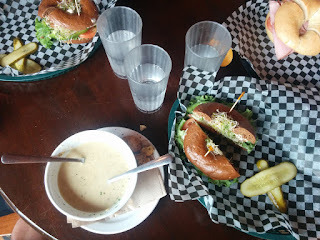 The food was good and the waitress very friendly She ensured we were all sufficiently hydrated, with her frequent water refills, for our trip to Miette Hot springs. 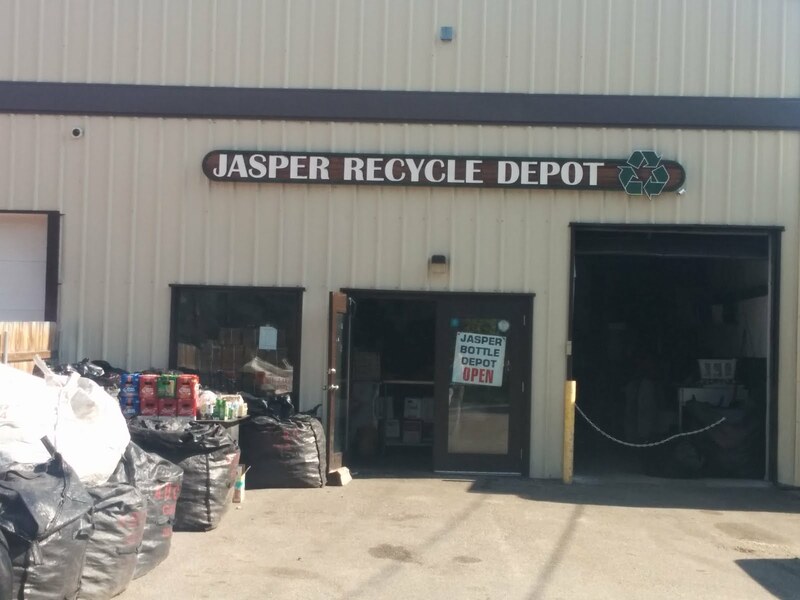 The leaflet described it as a 45 minute drive from Jasper but it was nearly an hour if you drove to the speed limit. It was approaching dusk and that's the time most of the animals come across the road to feed. We saw Caribou and deer but the major danger was avoiding the tourists that stopped alongside the roadside and then wandered into and across the road to take photos. When we reached to hot spring springs a folk of mountain goats were licking the salt from the car tyres of the cars parked in the car park.The hot springs were excellent value at just over $6 entrance. The water comes out of the ground at around 55 degrees centigrade but is cooled to a more reasonable 40 degree centigrade for the hottest pool. The 4 pools range in temperature from 10 to 40 degrees and all were sampled before we left. 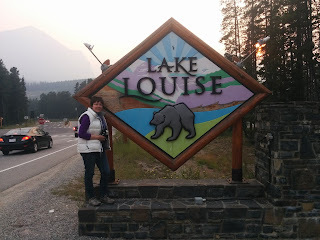 We arrived back to the lodge just before 11:00pm. We arrived at the hotel this evenning to find that instead of Internet isolation we have free WIFI and free international telephone calls. Our day started out with Weetabix or porridge for breakfast.It was then a quick look at the view point over the river before we checked out. Louise's friend who visited last year recommended the Bears Paw Bakery. It was an excellent recommendation and provided us with a fine array of provisions for lunch. A quick visit to a gift shop then coffee and cake back in the cafe and we were off to the Icefield Parkway. 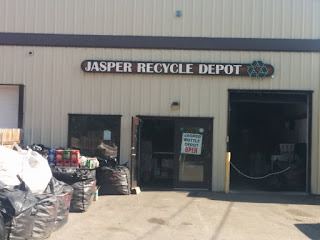 The first stop that is missing from most tourist itineraries was Jasper's recycling centre where our fine collection of used beer and wine bottles were traded in for 80 cents. 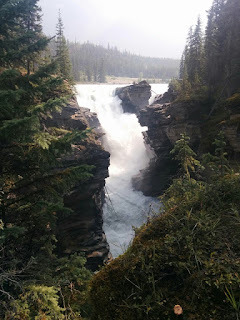 30 km from Jasper we stopped at the Athabasca Falls . 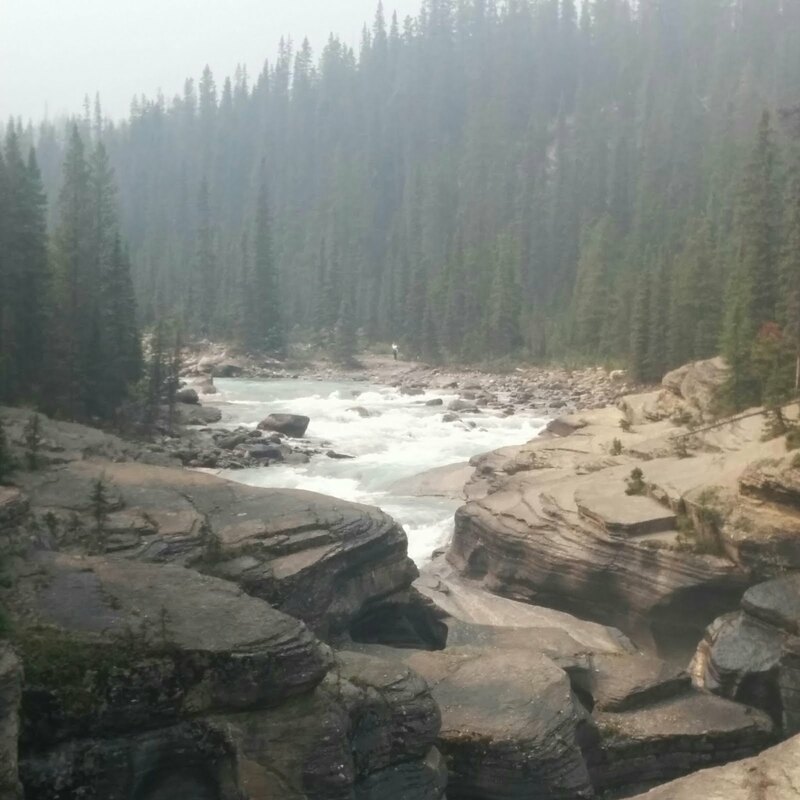 Photos were taken and falls admired from both sides of the river. 2,4 km further on and the next stop was Sunwapta Falls. Lunch was taken from the picnic area above the river. It was then down to the falls for more photos and video of moving water. Whilst the ladies set off in the car in search of a gift shop they had spotted when we turned off the main road I walked the 2 km though the woods to the Lower Falls. It was well worth the walk. They were very impressive and could be enjoyed in piece and quiet as only a handful people made the journey. The next 50 km were punctuated with stops to admire the views of the river mountains and waterfalls. 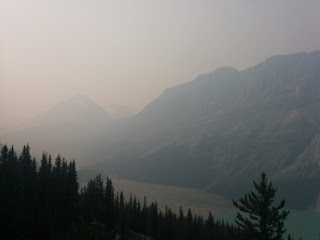 Our only regret was that a lot of the mountains were in a haze caused by Forrest fires in Canada and the US. 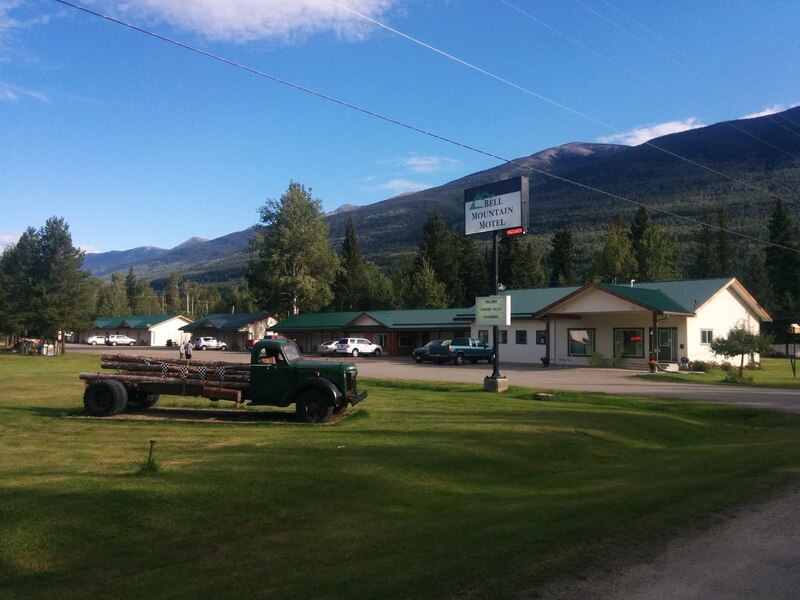 The Glacier View Inn has mixed reviews on Booking.com and Trip Advisor. 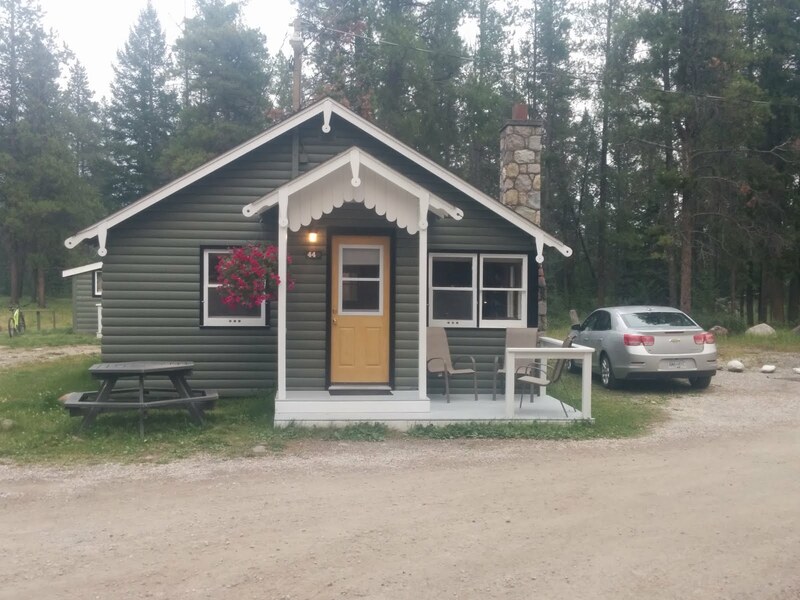 We booked it because of its location but were pleasantly surprised by the quality of the room the friendly welcome and efficiency of the check in. We booked the Glacier Explorer trip to take us onto the glacier. The 6 pm trip was the last of the day. A coach ferried us on the road for the first part of the journey to the transfer station where we boarded the vehicle that took us on a 20 minute journey onto the glacier. 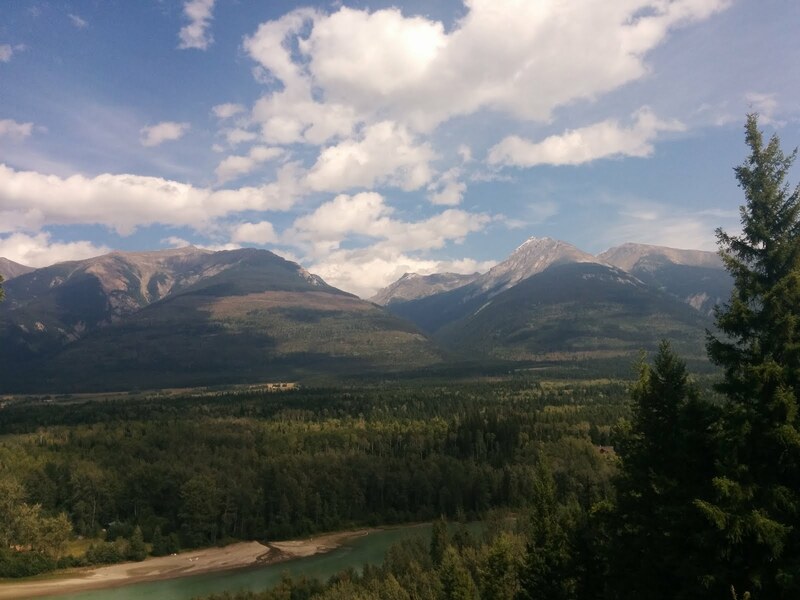 After a little encouragement from the passengers we drove down the "steepest unpaved road in Canada". The 6 enormous tyres guiding us safely down the moraine and on to the ice. We were then given the opportunity to walk around ,take photos and fill our water bottles from the melting glacier water. The horn was sounded and it was either get back on board or a long walk. We ate in the restaurant with a view over the glacier. 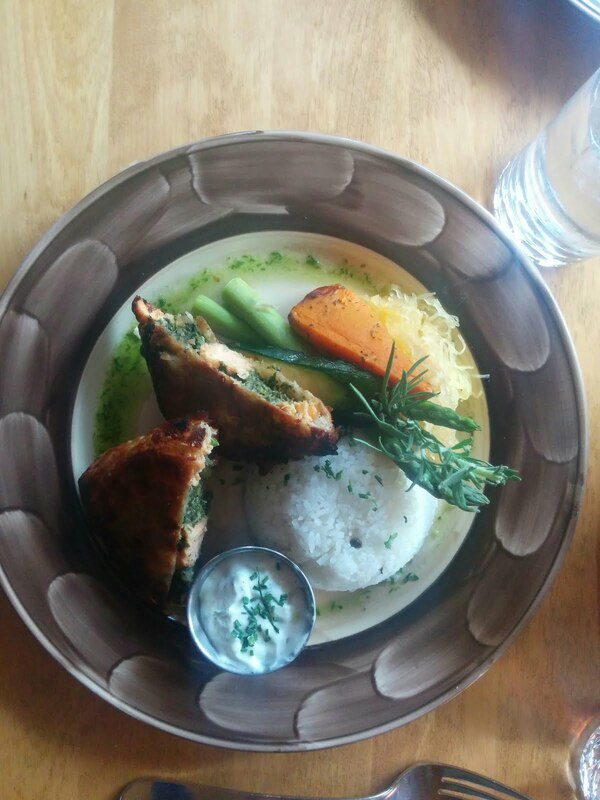 The food was OK and better than some of the reviews suggested. The view was excellent. A full day post to follow but we have no WIFI tomorrow so there may be a delay of a couple of days! Sorry for all those that are following our progress. Michaela explained the dangers of walking or cycling alone in the area. 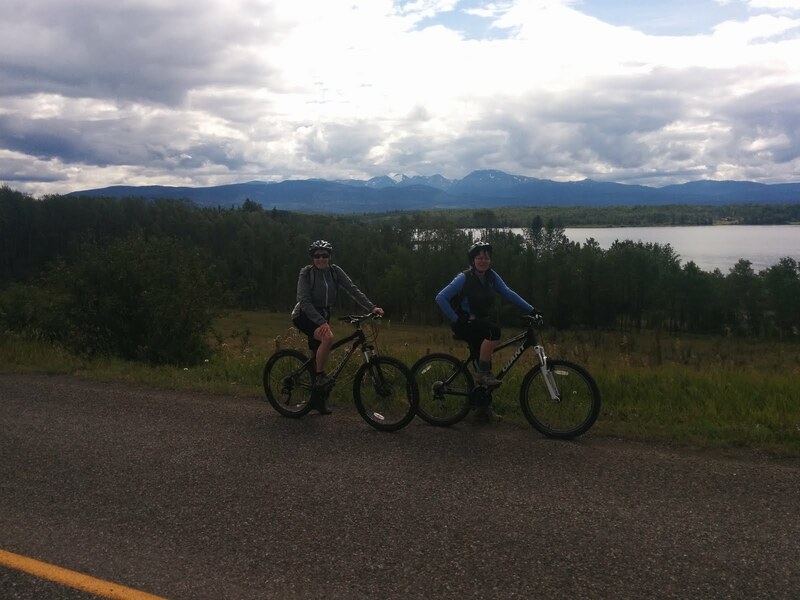 The 16 from Prince Rupert is known as the Highway of tears because of the number of young people that have gone missing when hitchhiking or cycling along it. Missing persons posters offering rewards for information are posted at a lot of the rest stops.It's illegal to hitchhike or stop to pick up a hitchhiker however that does not stop people from doing it. 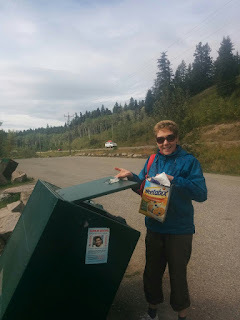 Michaela thought the danger from bears and coyote's was as great as being abducted and told us the frightening tale of a nurse who had been attacked by a bear when she was out running and how she herself had been knocked down and attacked by a moose. 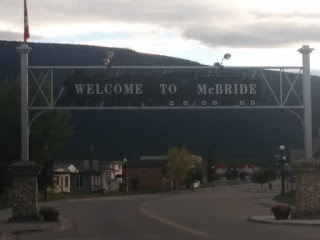 We set off on the drive to McBride just before 9:00. Google maps had the journey as just over 6 hours, Kate said 7:20 and Michaela estimated over 8 hours. It was going to be a long drive. 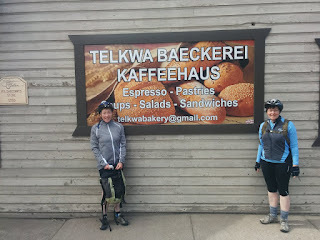 The first stop was the bakery in Telkwa we had visited yesterday to get a roll and cakes for the journey. Not a lot happens in the next town we passed through of Houston.However it does have the largest fly fishing rod in the world, 18 metres tall and weighing over 200lbs its not the most practical fishing rod but does cause a steady stream of tourists to stop before moving on. The scenery was rolling hills ,lots of trees, lakes and strips of agricultural land being used to graze cattle. By lunchtime we had just passed Fraser Lake. The cafe at the community museum in Vanderhoof was closed for refurbishment but the museum shop provided a souvenir opportunity and a reasonably priced piece of pottery was purchased. 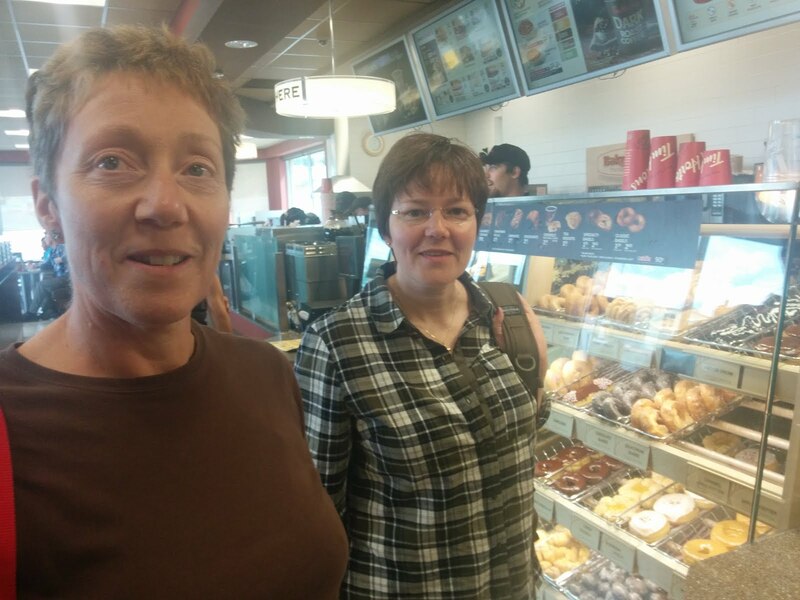 We stopped for a drink at Tim Horton's on the way out of town. We were not tempted by the displays of over sweet donuts and muffins. Louise's steamed milk caused the trainee member of staff problems. We were told they could not do it so I suggested could she have a latte without the coffee. That was not possible but she could have a tea latte and select a tea to have at home later! The coffee turned out to be the worst we have had in Canada. The major town in the area is Prince George. We stopped at the 2 Rivers Art Gallery. We did not have time to go round but did look in the shop where a souvenir bowl was purchased. 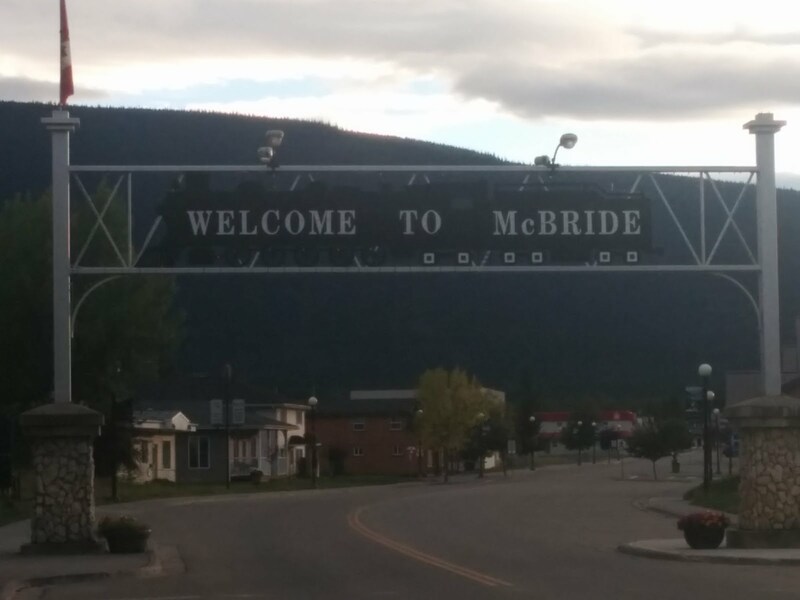 It was just over 2 hours from Prince George to McBride. The signs warned of the dangers of Moose but apart from one bird of prey and lots of rooks no significant wildlife was spotted. 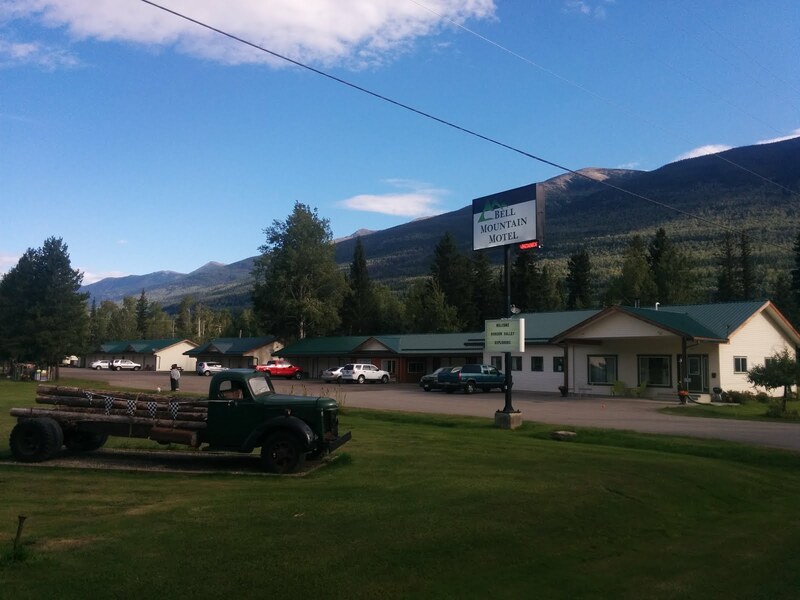 The Bell Mountain motel is set back from the main road and had provided us with 2 large rooms both with cooking facilities. We ate in the Giggling Grizzly on the outskirts of town. Lyn and Louise had steak and Robert Whiskey BBQ pork drummies with perogies. Perogies are a Ukrainian dumping made with potatoes, flour, sour cream and cheese. Something to try and make when I get back.